Read what led the Hawks to this point by clicking on the link to Parts One & Two below. The next season the team struggled from the get-go. The defense was one of the worst in the league and they had lots of issues with injuries. Clyde Lovellette missed over half the season with injuries, and his backup Larry Foust missed 23. Between their two point guards that had been sharing playmaking duties, Johnny McCarthy broke his leg and missed almost the whole season and Lenny Wilkens had a military commitment that made him miss all but 20 games. Paul Seymour was sacked after a 5-9 start to the year and replaced by Andrew Levane, who had almost ruined the team as coach back in Milwaukee, and he hadn’t improved since then. The whole season for the Hawks became Pettit trying to carry the whole team, with Hagan, now on the wrong side of thirty, starting to decline, and no other help at all during the 60 games Lenny Wilkens was gone. When he was there though, Wilkens was starting to look like he could be a star, as he averaged 18, 7, and 6. Long story short, Levane didn’t even last the whole year and the Hawks missed the playoffs for the first time since Bob Pettit’s rookie year. After the year, Lovellette was gone, sold to the Celtics, and in as his replacement at center was someone Marty Blake was obsessed with, but who was considered by most a massive reach for the third pick, in Prairie View A&M star Zelmo Beaty. The team tried out Pettit as player/coach but he just wanted to play so they gave the coaching job to former Knicks star Harry Gallatin. Noticing that a now-30 year old Pettit was still by far the best player on the team but was beginning to lose some athleticism, Gallatin slowed down the pace to be easily the slowest in the league. Cliff Hagan was now nowhere near the same player he had been a couple years prior, now only averaging 15 point a game, but Beaty filled the role he was needed in as a strong back-to-the-basket complement to Pettit. Wilkens was back full time but took a step backwards, returning to stats closer to that of his rookie year. Somehow things fell together though and they shot back up to the second seed in the west. Gallatin won Coach of the Year, Beaty made All-Rookie First Team averaging 10 and 8, and Pettit returned to fourth in the MVP voting after finishing outside the top five for the first time in his career the year before. They headed into the playoffs as contenders again, but had to play in the first round against the Pistons instead of getting a bye through the round. The Pistons didn’t pose a real threat, and Pettit played some of the best basketball of his career, averaging 36 and 17 in the series to help dispose of Detroit in 4. They then played the Lakers to battle for a spot in the finals again, and kept the series close throughout. There was a difference between this matchup and the previous ones though. Now it wasn’t just Pettit vs Elgin Baylor. Now Baylor had help. 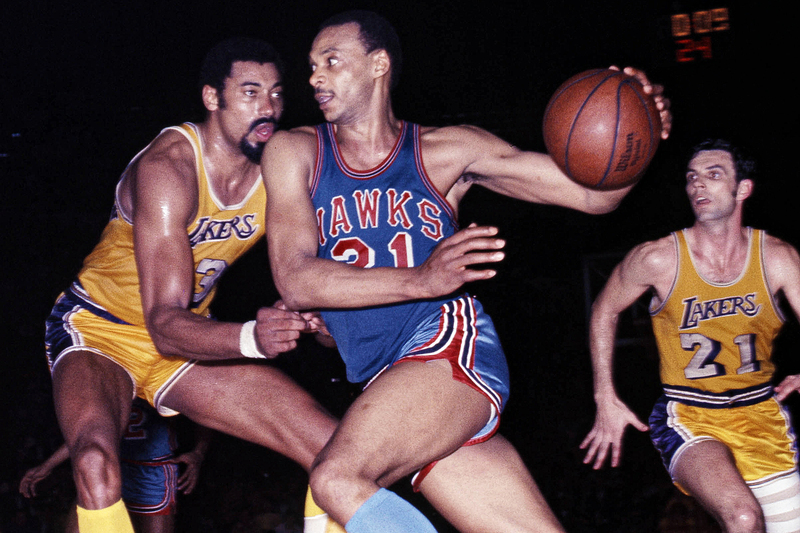 Jerry West’s star had begun to shine this season, and though Baylor was still definitively the star of the series, West helped push the Lakers over the top as they held off the revived Hawks in Game 7. Encouraged by their rejuvenated performance that year and knowing that Pettit was nearing the end of his prime, Gallatin kept the core of the team together but knew he also needed to add a two-guard that could counter Jerry West. He shipped out a second round pick and some cash to New York for the Knicks’ star Richie Guerin. Guerin was past his prime at this point but still easily an above-average SG. The team thrived with the addition of Guerin, and Pettit, Hagan, Beaty, and Wilkens all had more efficient seasons than they’d ever had before. Pettit was in the top five in both points and rebounds for the tenth year straight, Hagan bounced back a bit from his previous year, and Beaty developed further quite nicely too. They finally overtook the Lakers’ record, but the Warriors had relocated to San Francisco the year before and beat the Hawks’ record by two games. This meant the Hawks had a matchup with L.A. in the first round. Both Pettit and Baylor failed to dominate the series as much as they had in previous matchups, and West was the real star of the series, but it didn’t matter. After both teams swept their home games, Wilkens and Hagan went off for 30 and 29 points respectively and won St. Louis the series, meaning they were set for a matchup against Wilt Chamberlain’s Warriors, coached by Alex Hannum, the guy who’d led the Hawks to their title in ‘58. Things were looking up when Guerin scored 32 in the first game en route to a close win, but Wilt never let the Hawks get too far ahead, and he finished them off in Game 7, dominating Pettit for a 39-30-6 night and getting to his first finals matchup with Bill Russell. After this loss, Gallatin realized this was really the last chance for the team to contend, as Pettit wasn’t outperforming the league’s best players like Wilt and Russell anymore. He tried to bring someone new in, but it was to no avail; Marty Blake’s contacts couldn’t find anybody that they thought would fit with the team. Going into the season Gallatin made the decision to relegate Hagan to be used as firepower off the bench, starting young Chico Vaughn in his place to infuse some youth into their lineup. Vaughn didn’t provide too much more of a spark to the team, but Wilkens and Beaty were both now entering their prime and when Pettit started having recurring knee problems through the season they were there to pick up the slack. By New Years Day, Gallatin was gone, and Richie Guerin was made player-coach for the rest of the year. Despite an average start, Guerin led the team to a 28-19 record the rest of the year. In the playoffs they were set to face off against a Baltimore team that wasn’t expected to give them much of a threat. It ended up being the other way though. Pettit’s body wasn’t holding up from the knee injuries, and his production was literally halved for the playoff series. Despite Beaty’s best efforts putting up 19 and 14, Wilkens had shooting problems as well, without a fit Pettit in the post to distract from him, and the Bullets won three games to one. After that loss, what happened was exactly what Hawks fans had feared for the second half of the season. Bob Pettit decided his body couldn’t handle the wear and tear anymore and retired. Bill Bridges, who’d stepped up in Pettit’s absence with injury the year before, was made his replacement at the four and would go on to put up a very respectable 13 and 12. At that same time as all this, Ben Kerner had been noticing that the Kiel Auditorium had become even more worn down and was trying to find a new arena. Over the offseason he began negotiations with the city to get a new stadium funded for the team. The season surprisingly started off okay. The team was clearly Beaty and Wilkens’ team now, and those two kept them hovering around .500. After a December losing streak though, Hagan told Guerin he’d be hanging it up after the season. Guerin quickly acted to bring in a replacement so he wouldn’t have to on short notice in the offseason, and brought in Joe Caldwell from a frankly bad Pistons team. Beaty’s All-Star-worthy 21 and 14 per game led the team to scrape into the playoffs by one game, and earn a revenge series against the Bullets. And this time they were ready to be without Pettit. What they weren’t ready for? Bill Bridges coming out of nowhere to do his best Pettit impression and average 24 and 19 as they swept the Bullets. This set up another series against the Lakers, and though they quickly fell behind 3-1, they came back to force a game 7, as Guerin turned back the clock to average 20 points and 8 assists in the series. Heroics from him and the Big Z were still just not quite enough though, as West and Baylor ran wild in Game 7 and managed to win the Lakers the game and the series. Over the summer Hagan retired as promised, and Guerin found himself lucky enough to have Lou Hudson, a small forward like Hagan who was thought to be the draft’s top prospect until a senior year injury, fell to them at number 4. Having Hudson on the team turned out to be really important, as Beaty missed almost half the year with a knee injury and they would’ve surely missed the playoffs without Hudson. Off the court, Kerner was told by the city that they wouldn’t fund a new stadium, as the local hockey team, the Blues, had renovated their St. Louis Arena, but Kerner wasn’t interested in sharing an arena, so he started looking for someone to sell the team to. In January of 1967 he held talks with a consortium led by talk show host Morton Downey Jr. with the intent of moving the team to New Orleans, but the deal fell apart. Bill Bridges, coming off an insane run in the playoffs, earned himself a spot in the All-Star Game with averages of 17 and 15, but Hudson and the injured Beaty slightly outscored him. With strong postseason performances from Wilkens and Hudson they swept the expansion Bulls in the first round but Rick Barry’s offense proved to be too much for them in the second round. As the offseason began, there was a bit of an odd problem. There were two new expansion teams in the league and one of them, the Seattle Supersonics, selected Richie Guerin in the expansion draft. Which meant one team held his playing rights while another had him under contract as a coach. Guerin decided since he was coming toward the end of his playing career soon anyways that he would retire as a player, and subsequently try to, over the course of the year, come to an agreement with the Sonics on a way to get his full rights back to St. Louis. On top of that, Hudson was called into reserve duty for the military as the situation in Vietnam was escalating. Unlike players before him, Hudson was allowed to commute to the team to play for almost half their games, but since he couldn’t practice, he struggled and fell down to an average of 12 points. Which meant other players really needed to step up. And they did! Beaty recovered from his injury nicely, and him and Wilkens both played all 82 games in what was the first ever 82 game season. They easily took charge of the team and really made it theirs. Beaty returned to some of his best form like from a couple years before, and Lenny Wilkens for the first time became a 20 point per game player, as well as 5 rebounds and 8 assists which put him third in the league at the time. Bridges and Paul Silas, who stepped in for Hudson when he wasn’t there, both easily averaged double-doubles at the forward positions, and Joe Caldwell, that guy Guerin brought in a year and a half earlier to replace Hagan, who’d really just been a role player so far, stepped up and added 16 points a game of his own right. They got off to an unexpected quick start of 16-1, and with three all-stars in Beaty, Wilkens, and Bridges, plus Guerin earning Coach of the Year, they ended the year on top of the west, and for the first time since 1950 they had a better record than their rival Celtics too. Which meant they came into the playoffs expected to go far, and maybe get into the championship. But they had another thing coming to them. Despite a 46 and 22 explosion from Beaty in Game 2, they couldn’t figure out how to defend Jeff Mullins all series and quickly fell behind 3-1 after he hit a clutch shot in Game 4. They gave themselves a chance after winning by 26 at home but they couldn’t quite put it off and went home disappointed against San Francisco. Or well, rather, they went to a new home disappointed. In April, Kerner found a new buyer and the new owners immediately moved the team to Atlanta, where they’d become the only NBA team in the Deep South. Good news would come as Hudson was allowed to come back to the team full-time, and the team looked like they’d stay near the top of the league with his return. Three days before the start of the year, Wilkens was traded, in an attempt to reinvent the team for its new fan base. He went to Seattle in exchange for Walt Hazzard (or Mahdi Abdul-Rahman as he went by at the time), who had broken out as an all-star in the Sonics first year in the league the year before, and the rights for Guerin to be able to play again. 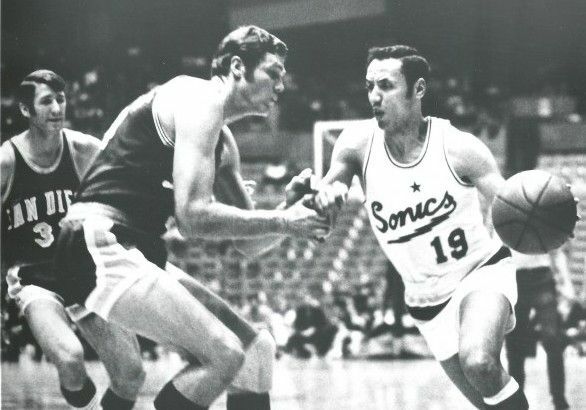 It quickly became apparent that that trade was a bad idea, as Hazzard’s stats in Seattle had been grossly inflated by the team being so poor, and Guerin didn’t really play much of a role on the court for the team anymore, while Wilkens put up his best numbers yet in Seattle. Beaty put up his ever-reliable 22 and 11, and Caldwell kept up his production from last year, but also while shooting over 50% from the field, crazy for a shooting guard at the time. But this was the year that Sweet Lou Hudson made it known that from now on this is going to be his team. Back and able to practice again he made a giant leap forward, going from 13 points and 4 rebounds to 22 points and 7 rebounds, and making the all-star game for the first of six straight years. Without Wilkens they made an expected fall from first to second in the West during the season, although they did have a nice 12 game winning streak in December that helped their case as fringe contenders. They got a relatively easy matchup against the Rockets in the first round, and the two teams matched up well.. Neither team won a game by more than eleven points, and if Rockets center John Block hadn’t missed the decisive game 6 that Atlanta won by two, it surely would’ve been a 7 game series. Up next would come another conference finals against the Lakers. West, Baylor, and Wilt were all over thirty so it was in their best interest to keep the pace slow, and they did. The league average that year was 112 points per game, and neither team ever scored more than 104. Beaty and Hudson individually had a good series, especially considering they were matched up against Wilt and Baylor respectively, but they had no help. Nobody else scored over 12 points a game that series. The Hawks went home after five short games, knowing they needed to rebuild before they could truly contend again.